Lightweight, portable tripod easel with ¾” tubular telescoping legs. Adjusts easily and securely in height from 35″ to 66″ with easy-to-turn collar which tightens legs into position without marring. Features cross brace for rigidity and adjustable board holders. 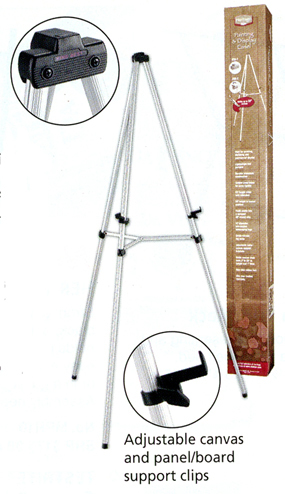 Lightweight, portable tripod easel with ¾” tubular telescoping legs. Adjusts easily and securely in height from 35″ to 66″ with easy-to-turn collar which tightens legs into position without marring. Features cross brace for rigidity. Holds signs or canvas up to 36″ high securely with adjustable springloaded holder at top of easel. 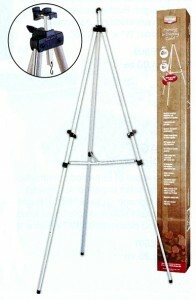 ALVIN® Aluminum Easel with Flipchart Holder Lightweight, portable tripod easel with ¾” tubular telescoping legs. Adjusts easily and securely in height from 35″ to 66″ with easy-to-turn collar. It is cross braced for rigidity and has adjustable board holders. Features an easily attached spring-loaded flipchart holder. The 24″ long holder is attached to the top for paper pads, presentation materials and signs.